Here we are in June already! Among everything else, this means that any outstanding payments are due ASAP, if you please. There are also still a handful of shares available for anyone who’s still hoping to join for the Season, but please do let me know soon. Things have been busy around here, with a little help from many different baby holders, Ernest entertainers, and aspiring green thumbs we now have a good chunk of the garden filled with future vegetables. Some of these include peas, garlic, kale, radishes, chard, tomatoes, peppers, eggplants, spinach, carrots, beets, lettuce and of course garlic that will be sending out scapes before we know it! Still plenty to plant, but lots in the field soaking up this rain and not just the cover crops! One of the many reasons to farm is to try new things, and this season I am trying a new cover crop experiment. Rye is one of the cover crops often suggested to help add organic matter to heavy clay soils (which is what we have here at Knuckle Down Farm). It’s also extremely cold-hardy, and when planted in the fall will stay green right through the winter and begin to grow again in the spring. Because of this, it helps keeps the soil well covered, keeping out weeds. 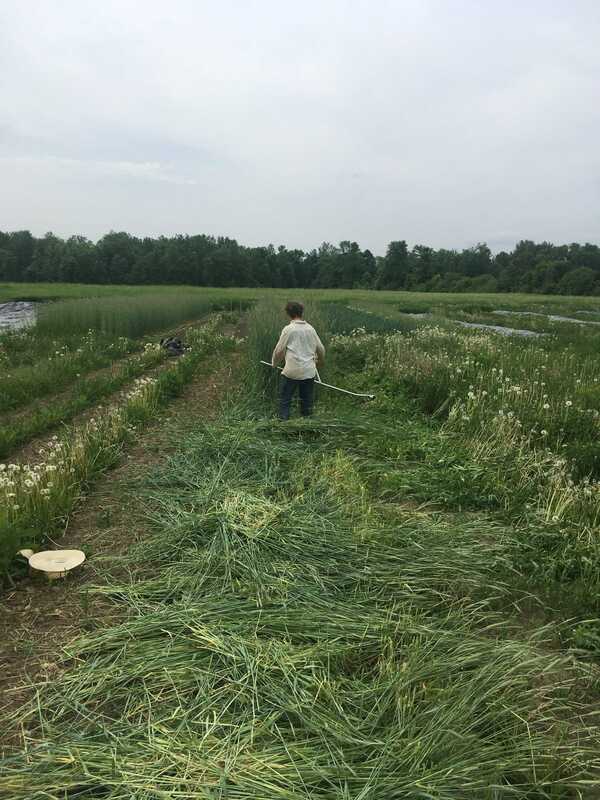 However, sometimes it’s difficult to kill and turn in, making it harder to quickly turn the bed over to vegetables than other less cold tolerant cover crops that “winter kill”. 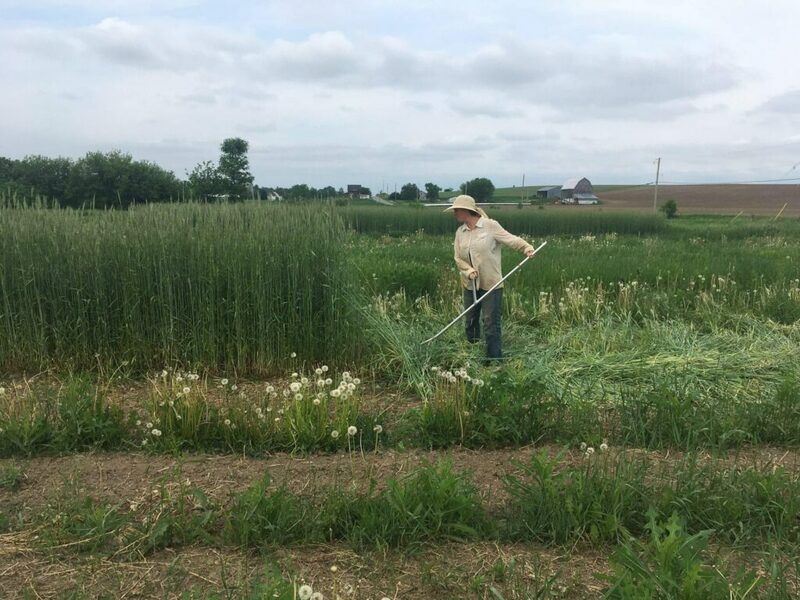 This season’s experiment is to let the rye grow right to the point of pollination (instead of mowing it down and turning it under when it is much shorter). The hope is that by cutting it now, just before the seed is viable but when all of the plants energy is being sent upwards, the plants won’t be able to grow back, but all of the organic matter from the roots will decompose right in the soil. The tops of the plants will provide a mulch right where they fall to be planted through in a couple of weeks. If this works, the soil in those beds won’t have to be tilled, allowing a healthy soil ecosystem to thrive beneath the mulch and allowing me to save time on weeding and watering! “No Till farming” is all the rage these days because of the carbon sequestration possibilities, so this is my little foray into the fray. That’s the theory, I’ll write an update the next rainy day once we see what the reality looks like! 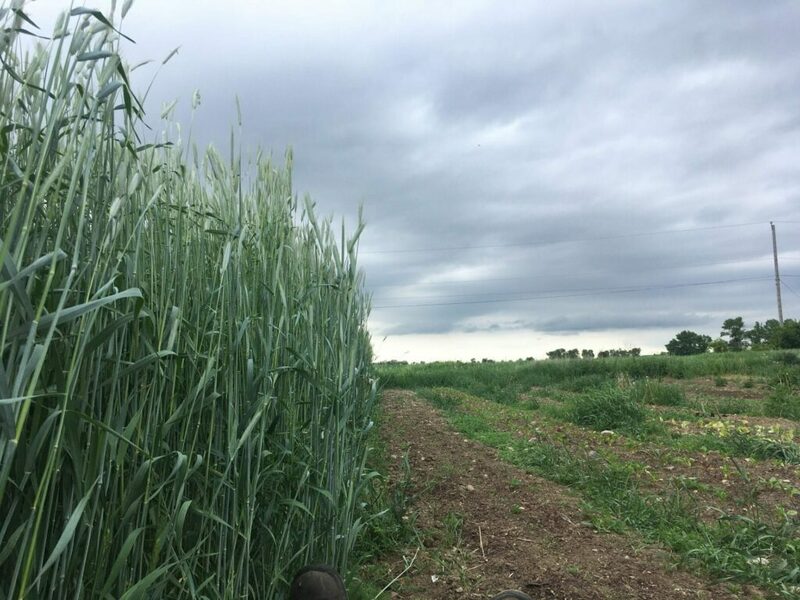 At the very least, I get to pull out the Scythe, which is always fun and in the meantime I love watching the wind blow through the tall stands of blue stems. Knuckle Down Farm is a small-scale organic market garden sitting on a quiet back-channel of the Trent River. We grow over fifty varieties of vegetables, herbs, and flowers with care and individual attention. 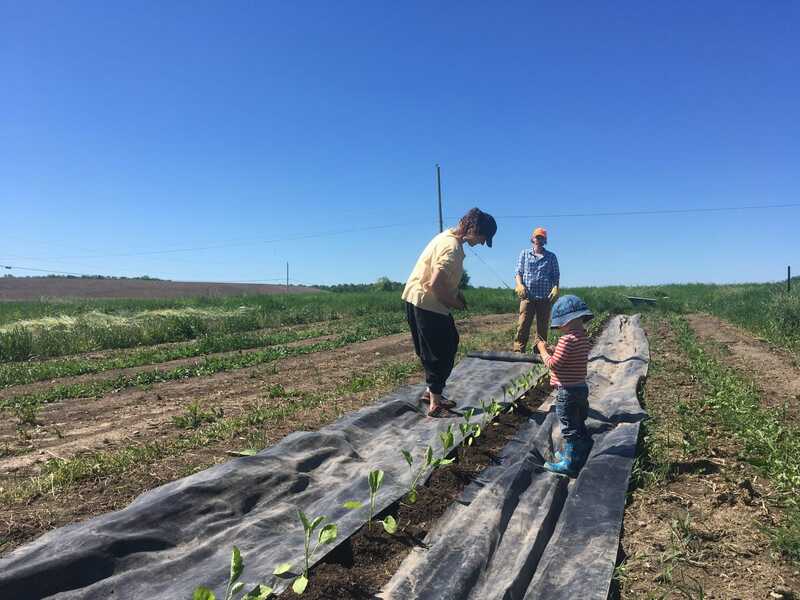 Our CSA veggie shares provide fresh, delicious, organic produce all summer while connecting members with the place their food is grown and the farmers who grow it. You can also find us at the Dufferin Grove farmers' market. 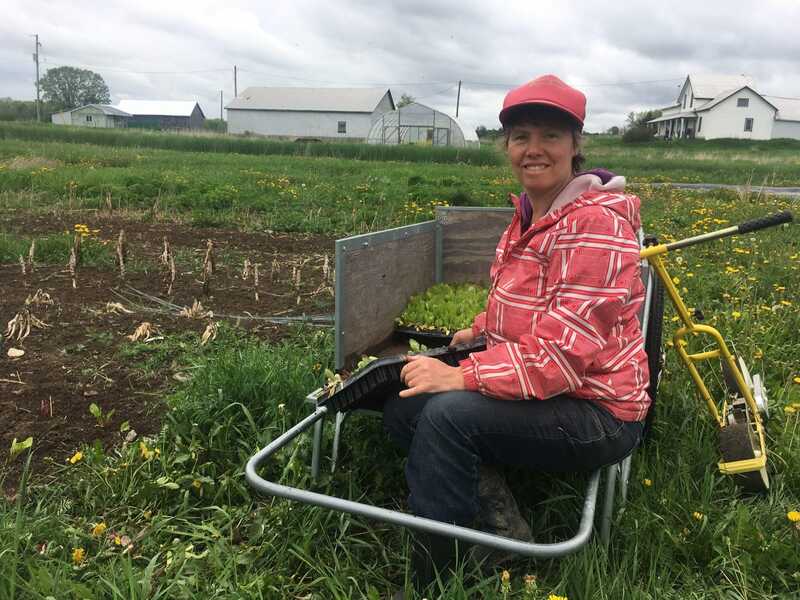 Farmer Jenny started Knuckle Down Farm in 2012 and moved to Quinte West in 2014.